Have you grouped any products together? If you answered “no” to any of these questions (or have no clue what we’re talking about), you’re in luck. Description: A simple product is a product with no variations (attributes) such as size or color. It’s basically a WYSIWYG product. Simple products can be sold individually, or as part of a grouped, configurable, or bundled product. By default, every product in your store starts out as a simple product. If your product has different sizes, colors, prints, etc., you’ll want to change your simple product into a configurable product. Example: This Isla Crossbody Handbag below that you “just happened to find” on Magento’s site is what you’re hoping for as a birthday gift is a perfect example of a simple product. It has no variation in size, color, material, etc. If your customer likes what she sees, she orders it. It’s that simple (I know. Shoot me now. I just couldn’t resist). Description: Configurable products are products that require the customer to choose options. They look like a single product with drop-down lists or radio buttons for each option (e.g., size, color, length, etc.). Shoes are a great example. Size and color options must be chosen. Each option is treated as a separate product with a unique SKU. This allows you to track inventory for each product variation. You could achieve a similar effect by using a simple product with custom options, but you won’t be able to track inventory for each variation. Example: You know that Nolita cami that you’ve been eyeing for weeks? Guess what? 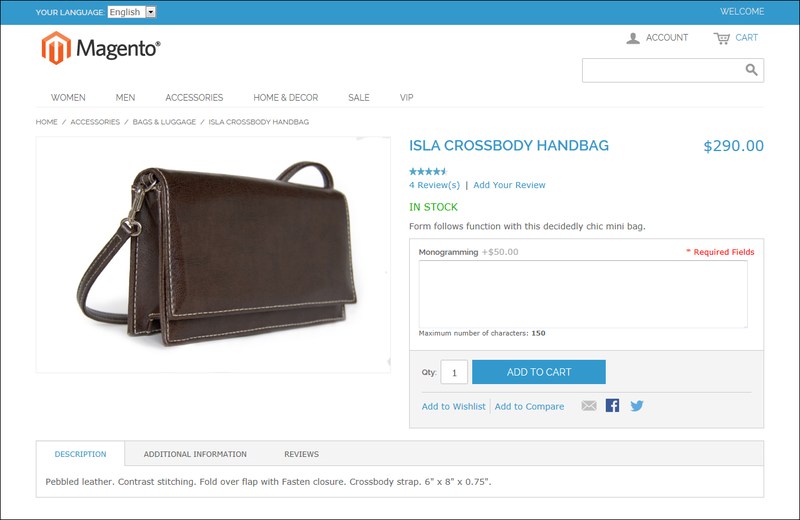 We found it on Magento’s site as great example of a configurable product. In order to add it to your bag, just choose a color (pink shown below) and size (Buy it now. Fit into it later). Description: Grouped products are two or more simple products grouped together and sold as a set. If you have multiple products that are related (e.g., camera, SD card, tripod), grouping them provides a convenience to your customers and is a super easy way to increase your AOV. Yes. All the products featured in the group can be purchased separately; however, if they’re all purchased as a group product, the price for each individual product is decreased. In the shopping cart, each product and the quantity purchased appears a separate line item. Example: Let’s say you’re into yoga. Not the wimpy, senior center yoga. We’re talking 105 degrees, 40% humidity, 90-minute Bikram yoga. 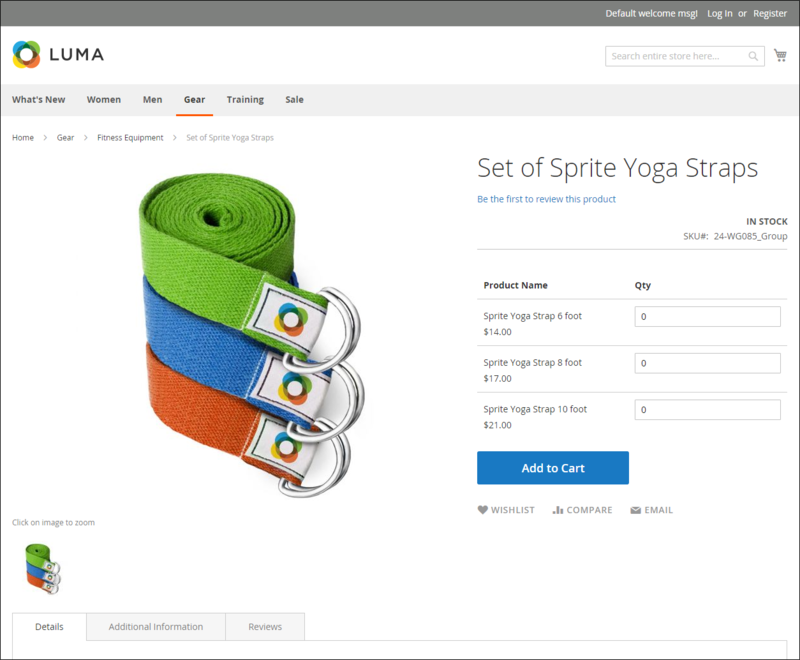 You need some new yoga straps and you stumble upon this hidden page on Magento’s sitemap. It features three yoga straps, 6′, 8′ and 10′ respectively. A perfect example of a grouped product and a perfect addition to your 32 pound yoga bag. Description: Bundled products allow your customers to build their own set of products. Each item in a bundle can be either a simple or virtual product. Bundled products are often confused with grouped products. 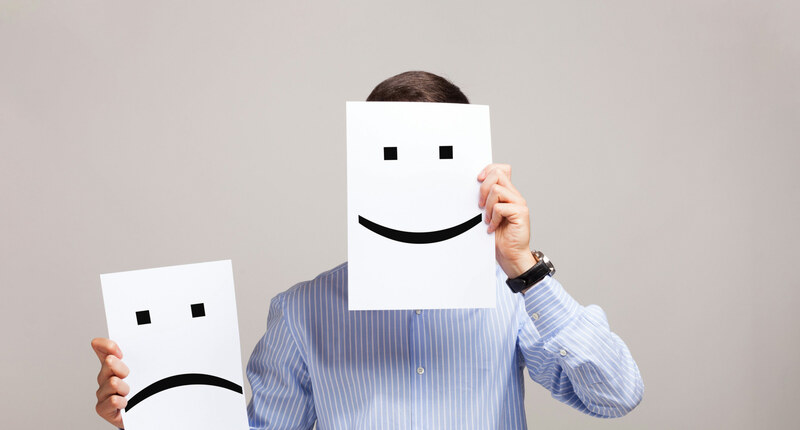 But, unlike grouped products, bundled products offer your customers the choice to combine the products they want. Example: You know cameras. Actually, you’re an electronics junky. You’re that person that likes to purchase computer parts separately and build your own (only G-d knows why). Bundled products are built for you. Let’s say you’re looking for a camera (again, only the good Lord knows why when you have an iPhone X sitting in your back pocket) and you stumble across the page below on (you guessed it) Magento’s site. It’s the bundled product of your dreams. Camera, carrying case, memory card and warranty all in one. All it’s missing is a bow on top. Now that’s convenient. Description: Although virtual have no physical dimensions, virtual products can be sold on your Magento site. 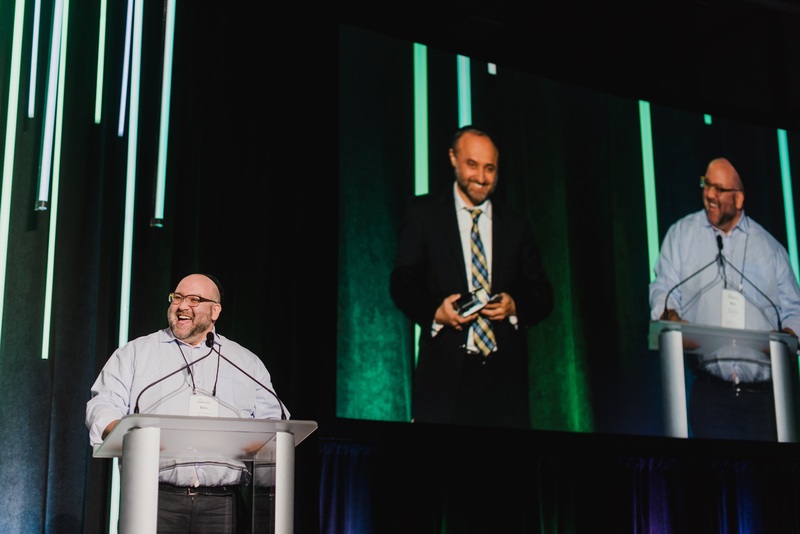 Common virtual products are services, memberships, warranties, and subscriptions. Virtual products can be sold individually or included with bundled products (see example above) and grouped products. Example: You’ve decided to get in shape (again). And guess what? 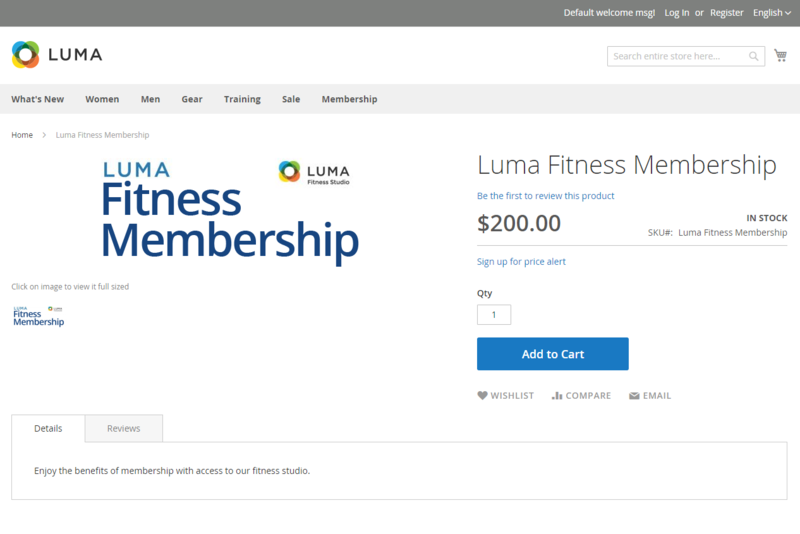 Luma’s not only Magento’s default theme, it’s also the latest craze in fitness. And for a limited time, membership is only $200 as you can see in the screenshot below. Description: A digitally downloadable product consists of one or more files that can be downloaded. 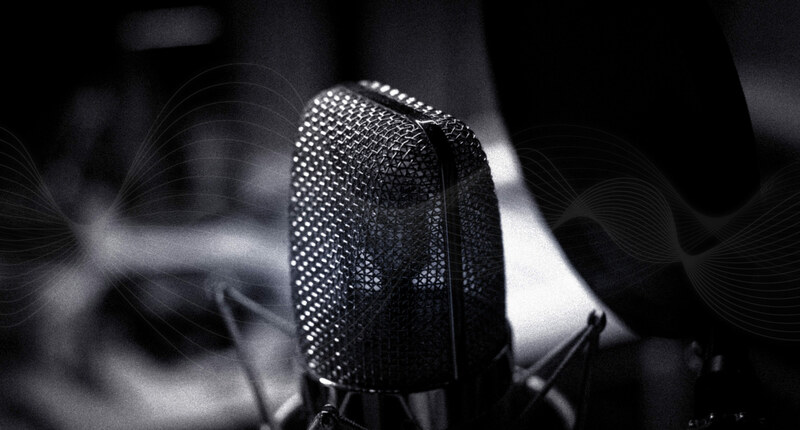 Because the downloadable file doesn’t become available until after the purchase, you can provide samples, such as an excerpt from a book or a track from an album, that a customer can try before making they purchase. Customer logs in to an account to receive the link. A link is sent via email and can be shared with others. The files can be downloaded from your server or be linked to a different server on the Internet. Example: You’re not left-handed. Everything thinks you are. But you’re not. 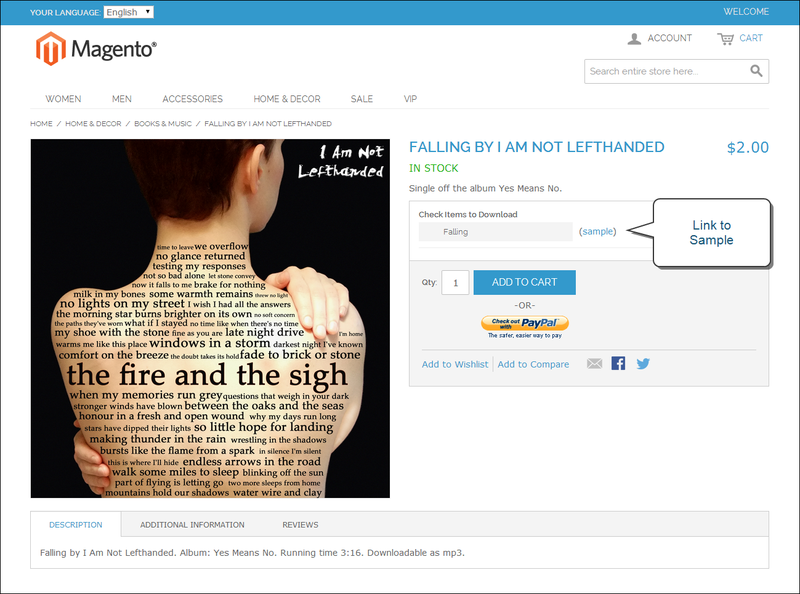 To prove your point, you want to purchase the single, I am not left-handed by Falling. By divine providence, the same Magento site you’ve found a Luma fitness membership, camera bundle, yoga straps, a Nolita cami, and an Isla crossbody handbag also has the single you’re looking for. What are the chances?! Before purchasing, you listen to a sample (because it’s free) and then snap it up. 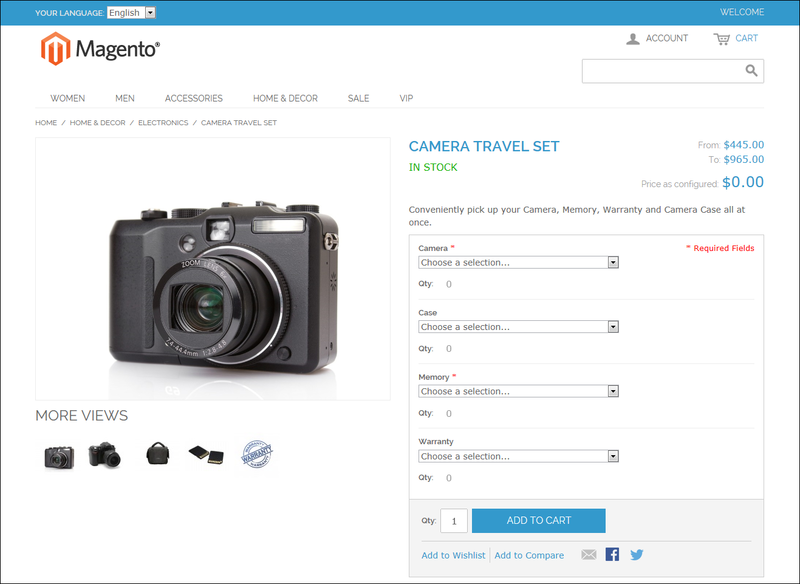 Your Magento store is going to be filled with products. It’s in your best interest to sit down and think about how you’ve set them up. Can any products be bundled? Can any be grouped? Answering these simple questions can lead to big increases in your AOV and overall bottom line. Even if you have already have a flourishing Magento store, it still behooves you to take inventory of your taxonomy to make sure you’re setting yourself, and your store up for success.